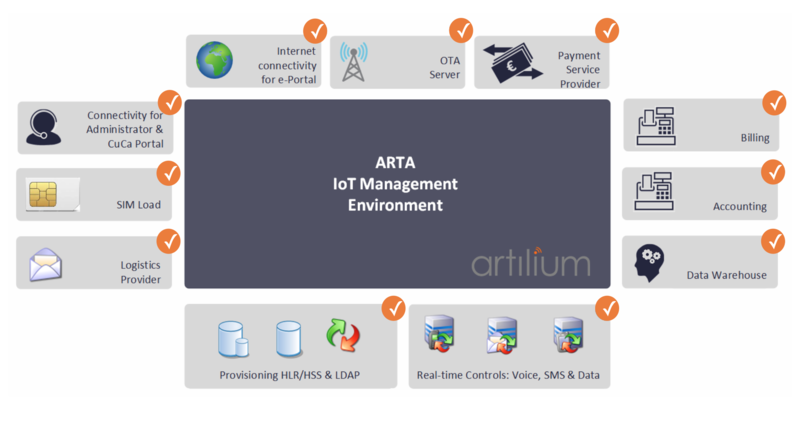 Artilium’s Internet of Things (IoT) Connectivity Management Platform is flexible, scalable and uses state of the art Technologies. The Artilium IoT platform allows you to easily connect and manage the connectivity for your IoT services. Artilium’s IoT solution is multi-tenant allowing your partners to connect and manage their own IoT services, in their own secure and controlled environment. Overall the Artilium IoT solution ensures a quick & efficient launch of customers new IoT services, which enables our customers to manage and control their connected IoT devices, appliances, services in real time. Artilium’s IoT platform allows our customers to create and deliver their new products, limitless applications and services, all under their control within one platform. IoT solutions are typically used to deliver a cost efficient technology solution saving operational costs, deliver new products and revenue streams, deliver environmental projects, information data services, IoT device management, efficient planning and delivery, improve transportation and logistics, monitor sensors, provide value added services and many more. Imagine you have sold a dishwasher to a customer. At some point in time the dishwasher appliance notices that the pump is showing failures. The appliance then sends out an automatic message to the control center. The control center checks what is going on and calls the customer to make an appointment for repair. You can plan the visit (instead of making an emergency visit). Your company is responsible for refilling the candy machines which are spread out over the city or multiple cities. Currently you would fill up the trucks and let them drive to all the machines, even going to all the machines which do not need a refill. With IoT the machines will send out an alert which candy needs a refill (if any). With this information you would fill up the trucks and plan the route to drive. You are driving in Amsterdam next to the Canals looking for a parking. This could take you a long time (for example 1 hour) to find one and you will be late at your appointment. Your agenda will be a mess and you will be longer in the city with your car then needed. Imagine you have an app showing you the shortest route to next empty parking space in the area of your destination. Modern Cities have many rubbish bins for residents and visitors to deposit their rubbish, either for free or paid for. In the example of paid, the IoT connected trashcan identifies the client subscription based on a contract or rate card. Regardless if it is a free or chargeable service or not the rubbish need to be emptied. Normally the city would send out garbage trucks which follow the same route and pass all the rubbish bins regardless if they are full or not. Blocking traffic and costing money. In some cases the bins are so full that people just deposit rubbish next to the bins, making a smell and attracting vermin. Imagine the rubbish bin sending out a notification when they are 90% full, making a Dustbin Lorry is immediately scheduled and the most efficient route planned.